Survey shows dangers of turning a blind eye to Palestinian Authority-sponsored religious hatred, casts doubt on prospects for peace. As the US government pushes for peace talks between Israel and the Palestinian Authority (PA), a recently-released poll by the Pew Research Center suggests that the Obama administration's apparent optimism over the prospects for peace may be somewhat misplaced. In a survey held across 11 different nationalities with large Muslim populations, Muslim respondents were asked about their views on "Islamic extremism." The results showed uniform opposition to such ideologies, as well as widespread rejection of suicide bombings - in all but one set of respondents. In one question, those interviewed were asked whether they believed that suicide bombings can ever be justified, and were asked to select from one of the following options: "Never," "Rarely," "Sometimes," "Often" and "Don't Know." A sizable majority (62%) of respondents from the "Palestinian Territories" (referring to Palestinian Authority-controlled Judea and Samaria, and Hamas-run Gaza) answered that suicide bombings were at least sometimes justified - nearly double that of the second-largest body of support (Lebanon, 33%). Muslims from the "Palestinian Territories" were also way ahead of the pack when it came to the percentage of respondents who felt that suicide bombings were "often" justified: a whopping 37%. In comparison, the next highest percentage of respondents who answered the same was in Senegal, at a mere 11%. The country with the greatest opposition to suicide bombings was Pakistan, where Al Qaeda and Taliban coordinated attacks have almost exclusively targeted other Muslims, from members of minority sects to political opponents. Despite widespread support for suicide bombings - presumably against Israel - by Muslims in Judea, Samaria and Gaza; 64% still said that they were "concerned" about Islamic extremism, indicating that much of that support comes from the more secular camp aligned with factions considered more "moderate" by western countries, such as Mahmoud Abbas' Fatah party. Fatah-affiliated terrorists carried out scores of suicide bombings during the "Second Intifada" between 2001 and 2006. 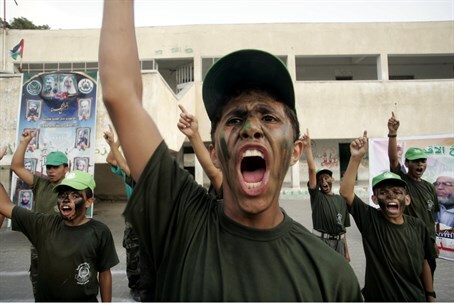 The results should not be surprising given the widespread campaigns of incitement by both Hamas and Palestinian Authority, according to Itamar Marcus, director of Palestinian Media Watch (PMW), an NGO which monitors incitement in the Palestinian media. "The Palestinian Authority, through its religious establishments, has been presenting the killing of Jews as an Islamic imperative for many years," Marcus said, speaking to Arutz Sheva. "Just last year the [Palestinian Authority-appointed] Mufti of Jerusalem quoted the Hadith [Islamic teaching] which was quoted throughout the intifada period, saying that the end of days will only come when the Muslims kill the Jews. "The constant brainwashing of Palestinians by their leadership... that killing Jews in the name of Islam is a duty, has clearly influenced them." Marcus also lamented the fact that, in his view, many media commentators and political leaders turn a blind eye to religious incitement by the PA.
"People do not give enough attention to the phenomenon of incitement to religious hatred," he said. "This is one of the most significant parts of the conflict, and it is completely ignored by the political establishment," he says, urging world leaders to "look around the region" to see why it is "a massive mistake" to ignore religious hatred as a factor in fueling conflict. Marcus' comments echoed those made last month by Abraham Foxman, Chairman of the American Anti-Defamation League (ADL). Following concerted pressure on Israel by both the EU and the US, Foxman accused western states - in particular the EU - of handing the PA a "free pass" when it came to "actions and inactions that are unequivocally obstacles to peace," including incitement.